High street shops often sell plenty of scarves that we can use as hijabs. Dorothy Perkins in particular have several in leopard print, zebra print, florals and stripes! Prices start at £10 - check out the full range here. 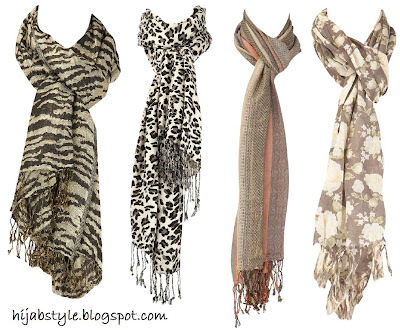 They are lovely scarves but I think they'll look odd as hijabs especially the zebra and leopard print. The last two scarves will make lovely hijabs though. I reckon she looks fab!